TIBET AWARENESS – THE “CORRECT” WAY TO FREEDOM. 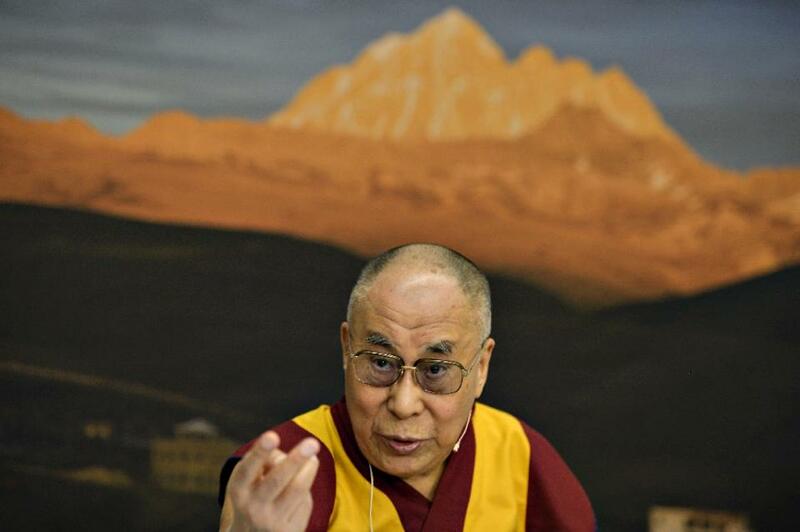 RED CHINA HAS AGAIN REJECTED DALAI LAMA’S “MIDDLE WAY” FOR TIBET. Red China has again rejected Dalai Lama’s “Middle Way” for Tibet. Now, there is no more ‘Middle Way for Tibet. I am inviting all Tibetans to find the One and the only One “CORRECT” Way for Tibet, a true and real Way to Freedom. As Doomsayer of Doom Dooma I predict Red China’s sudden, unexpected, unavoidable downfall, utter ruin of her political, economic, and military power. TIBET AWARENESS – THE “CORRECT” WAY TO FREEDOM. I AM SEEKING APPLICATION OF COMPASSION AS A PHYSICAL FORCE TO UPLIFT RED ARMY FROM TIBET WITHOUT CAUSING PAIN OR SUFFERING. I am seeking application of ‘Compassion’ as a physical force to uplift Red Army from Tibet without giving them pain or suffering. 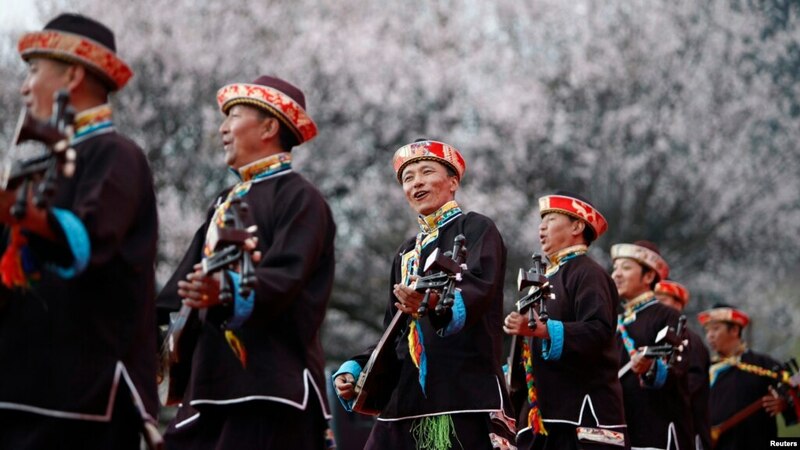 Tibetans play their traditional musical instruments to commemorate Serf Liberation Day in Nyingchi Prefecture, Tibet Autonomous Region, March 27, 2014. China has marked the 55th anniversary of the dismantling of Tibet’s government in Lhasa with another explicit rejection of the so-called “middle way” approach of the Dalai Lama that emphasizes autonomy for the region. In the televised speech Thursday on state-run Tibet TV, the chairman of China’s Tibet Autonomous Region [TAR], Losang Gyaltsen, said the Dalai Lama’s approach is “a camouflaged approach” that seeks Tibet’s independence. “Tibet cannot be independent, neither can it be a semi-independence or disguised independence,” Gyaltsen said, standing next to China’s national flag. He added that China’s fight against a “Western enemy force” and the “Dalai Clique” is an important political fight for unity versus separation, democracy versus authoritarianism, and progress versus backwardness. Kunga Tashi, who works in New York for the exiled Tibetan government, said the statement shows that Chinese leaders are unwilling to compromise to solve the Tibetan problem. In addition to the speech Thursday, Chinese officials carried out a campaign this week to highlight how much they say conditions have improved in Tibet since China took over. Beijing frequently cites improved living standards in the region when defending its rule. Tibetan exile MP Kalsang Gyaltsen Bapa said the comparison of old and modern societies is just an excuse. The anniversary, which China calls “Serf Liberation Day,” marks Beijing’s 1959 dismantling of Tibet’s government in Lhasa shortly after the Dalai Lama fled into exile. The date, however, has been officially commemorated only since 2009. This report was produced in collaboration with the VOA Tibetan service. “Tibet is inherently belongs to China, also can be traced back to the tang dynasty ago.” Who said it and how much truth in it? I think there are no similarities b/w Chinese N Tibetans! They are two different races, culture, language and political history. Middle way purpose by the Dalai Lama is very realistic solution for both China and Tibet. Dalai Lama masterminded the massacre of Buddhist monks in Tibet years ago to stop other culture and religion from existing in Tibet. Notice how this anonymous poster provides no evidence or even specific facts regarding this outlandish accusation against the Dalai Lama. What we do know is that the CCP is responsible for oppression of Tibetan monk and nuns since the 1950s. Nearly all of Tibet’s 6,000 monasteries were destroyed by the CCP and those that have been rebuilt were largely paid for by local donations. The day will come when nations of the world ,especially Asians, will unite and overturn paper tiger China. What has been illegally stolen, as Tibet and land from the Uighur’s, will go back to its rightful owners. China is corrupted and polluted to the core. Millions are dying from pollution and nothing is being done. The money factor is much more important than saving their own lives. China wants to brush aside the US and the Western world and take over, but in the end, it is a snake biting its own tail. China should never had copied Western capitalism. Had China been more eco-oriented, the world would have praised its true values, and perhaps would have imitated its leadership, but who wants China now? Only greedy world corporations deviating their national interests and benefitting their own pockets. Yes, money comes first and citizens last. Absolutely, well said RS, I agree with your points 101% and thanks for standing in solidarity with us. Tibet will be FREE! In the history of Tibet is inherently belongs to China, also can be traced back to the tang dynasty ago, my side of the Tibetan compatriots have been artificially in Chinese.The dalai lama’s middle way there is no so-called really representative of the ideas of the masses.Only in people with real voice.Reminds me of the people often say that reports often distorted the facts. According to the PRC, China’s claim to Tibet goes back to the Yuan Dynasty so you didn’t pay attention too well in CCP class. There simply is no historical evidence that Tibet was an integral part of China prior to 1951. Chinese in mainland are too arrogant to be aware of that all other countries in the world are at the side of Tibet. Chinese Government (PRC) will collapse soon due to the blast of its intentionally created Bubble Economy or no responsibility for air pollution. And what’s so bad about Tibet’s independence? It’s surely better for Tibet to be independent of a cesspool called “China”. Then why the west is against the Crimea’s referendum? You are a fool if you believe the west media! We Chinese will fight for our territory integrity! Those Tibetans who don’t love China, you should go away, go to democratic India, to see if you can have a better life. Dalai was a slave master and he still wants to regain his position. But Tibet doesn’t want to be slavery again! If you think comparison between old Tibet and new Tibet is unfair, then compare those Tibetans live in democratic India and those live in dictatorship China, who is living on a better life standard? J. Huang, do you know what human life is all about other than having better living standard? If you only care about better living standard than you are nothing more than an absurd, why? even animals living in zoo with all the facilities doesn’t want to live in zoo, why? because they don’t have freedom of their own with all aspects of their way of living, i.e. running in wild, breathing in fresh air in wide open space, free to play and to mate with their own desire etc. So, can you remain happy in zoo with all the good foods, drinks and with all the good facilities like those wild animals in zoo? Can you live without freedom? If you believe in CCP’s fabricated story, you are nothing more than a blind stooge. His Holiness the Dalai Lama is the most revered, most loved and respected personality in this world, those who revere him are not a blind and stupid like yourself, they use their own intellect to find the truth by analyzing and with reasoning, and once they find the truth and purity than they believe in that, but for a foolish people like you, chairman Mao becomes God like after murdering 45 millions of Chinese, you don’t know how much suffering he created in China, Tibet, Mongolia and Xinjiang, it is because with a support from a ignorant and blind nationalist like yourself others who are who supported Mao and CCP in power. If you have such strong nationalist feeling of PRC, why you are living in Canada, why you have to use English name “Jonathan” as your first name? this shows that you are just an opportunist stooge and you don’t know nothing about freedom, justice, humanity and truth on Tibetan issue, for you everything counts on money and materialistic satisfactory, poor you! which is why people like you still remain like puppet, and your poor mentality is dragging your children and grand children to become a slave of CCP, I feel pity on you making such stupid comments on HHDL and non-violent Tibetans. Mr. Huang is well-known here as a member of the 50 Cent Army paid by the CCP for his pro-CCP statements that parrot CCP propaganda. Notice he provides no evidence or facts to support his outrageous claims. The colonial mentality of the CCP is to accuse Tibetans of being barbaric &amp; backward to justify their 1950 invasion. Why is it that majority of Tibetans want the return of the Dalai Lama and the CCP out of Tibet if Huang’s claims were true? @roboco stop trusting the west media and west propaganda! They are plain liars! They lied about the excuse of starting Iraq war, they are lying about Ukraine crisis and Crimea referendum. Tibetans are enjoying their better life in China except few brainwashed young monks who refuse to see the big picture of Tibet. Any way I strongly suggest China should learn from America and Australia about how they treated aboriginals. You are from Australia right? Tell me did you white ppl give back land to aboriginals? Dd you give them independence? Did white ppl kidnaped aboriginals kids and sent them to white families by force? Shame on you, you are animals! It is no secret that the US wants to use Tibet as one entrance area to destabilize China. Sadly, under the guise of “supporting” independence for Tibet, the US really doesn’t care for the Tibetans, only for its interests in destabilizing China. The Tibetan clergy in Lhasa was without a doubt a despotic government – and would be a despotic government again, religion has no other way of governing than despotism – it has nothing to offer beyond religion. The Dalai Lama is dishonest, trying to convince with sly lies – but ignoring the pressure the religious establishment put on young people to self-immolate in protest against Chinese rule. Most Tibetans likely prefer Chinese rule, because it allows them to work for their own good instead of that of the religious establishment, but brainwashing with the supposed good of ‘tradition” and the fear of reprisals may keep many Tibetans silent on their true preference. It would incumb on the US to stop its false propaganda. As to the Tibetans, there is a lesson to be learned from the recent US instigated events in Ukraine which the US characterized as a fight for freedom and dignity and democracy. Ukraine already was a democracy – maybe not perfect, but nevertheless, democratic. With IMF loans all that freedom and dignity will be summarized as dire poverty of the people, exploitation of their resources and a practically impossible struggle to restore livable conditions. Is that what Tibetans really want? But that is all the US would have to offer. In comparison, China brought development and tangible improvement away from dire poverty. Ha!..ha!…ha!…China brought development and improvement in Tibet. No! No! not all, China came to destruct and loot the Tibetan resources, and China truly wants cultural genocide in Tibet. Late Penchen Rinpochey made this public statements just before his death: He said, if we analyze and calculate carefully and find loss and gain on Tibet after the invasion, Peoples Republic of China brought more destruction and suffering rather than truly benefiting Tibet and Tibetan people, after making these strong and sharp points against CCP of PRC, he was poisoned and died a mysterious death in Shigatse, this is the true reality what CCP does if some one speaks the truth for the cause of Tibet. At present all the benefits from the mineral resources from Tibet is taken away to China and the true benefactors from the mineral resources are the politburo leaders and their members in power, not even the Chinese people. Don’t you know that most of the Chinese leaders have overseas bank account, a tax haven? Why? it is because the money they earned is not legal, it is the money they stole while they were in power. Concerning U.S.A. supporting Tibetan independence, it is all nonsense and baseless comments, how can u.S.A. support Tibet’s independence, when they officially says Tibet is a part of China, which means they don’t recognize the sovereignty of Tibet. However, in reality, Tibet is for Tibetans, as China is for Chinese and India is for Indians. Tibet is a sovereign country invaded and occupied by China in 1959. Don’t make excuses of bringing development and false comments, truth will shine and Tibet will be a free country sooner, just wait and watch! It’s interesting that comrade Huang is unable to provide any response why the CCP won’t allow the UN or any independent investigators or journalists into Tibet to investigate the human rights situation. Only when they are accompanied by CCP officials and given an official tour to showcase Tibet but never any unsupervised or independent investigations. That’s why the CCP has zero credibility on the Tibet issue. They can’t provide verifiable evidence to support their claims. Besides if comrade Huang supports the Crimean referendum then why can’t Tibet & Xinjiang also have a referendum on independence? It seems when it comes to China, it’s do as I say not as I do. Comrade Huang’s earlier posts confirm his colonial mentality. He implicitly recognized that Tibet was invaded & occupied and that Tibetans have no rights. It’s that Stalinist-Leninist-Maoist mentality that tolerates no dissent or opposing views. @wangchuk, you are a CIA troll. No matter what China does, west propaganda still bashes China. We open up Tibet to our friends but not to our enemies. And go hel separatist! Tibet belongs to China forever! It seems another member of CCP’s 50 Cent Army is here. These people are paid to spread CCP propaganda on online forums. If Tibetans are truly happy then open up Tibet to UN and human rights investigators and stop blocking access to Tibet by foreign journalists. Stop censoring the media and allow freedom of speech in China &amp; Tibet. Let Tibetans have self-determination to decide for themselves to live in a free &amp; independent Tibet or part of the PRC. Someone from Switzerland. Please don’t be a fool, life standard improvement is the first step of reaching freedom and democracy not the opposite. Look what happened to India, Ukraine, Mexico and Thailand, for poor countries, freedom means chaos, riots, genocide! Communist party is very smart and long realized this problem, and that’s why China is the only developing country can remain fast growing and relatively stable. As for Tibetans, my advice is stay calm, learn science, forget Dalai Lama, work hard and make money, if Han Chinese can be rich, so do you! Minorities in China have much more privileges than Hans. Minorities can have more than one child and go to universities with lower GAP. So stop complaining, if you are not richer than Hans, then that’s your problem, either you are stupid or you are lazy! Does “development and tangible improvement away from dire poverty” excuse the Chinese government’s use of force? Pulling out women’ reproductive organs so as to stop them from having children is just one of the things the use of Chinese force has done to Tibetan civilians. The Chinese government has taken a process of deterioration of Tibetan identity, Tibetans, and not advancement and development. Safety in Tibet cannot be achieved through heavy security. You might not believe in the Dalai Lama, nor might you believe that the US’s intervention is wholly selfless but that doesn’t matter. The cruelty, the sheer violence in that region is inexcusable. If a society doesn’t recognise freedom of speech, there is no truth. I’m afraid that may be the case for China. It’s true, over the past 20 years the Chinese authorities have allowed Chinese people to emerge from poverty and have access to knowledge and better education. You were able to move around and have access to classes. But there are socio-economic and norm problems to this. Not everyone was able to benefit, and this created a great deal of injustice and tension with those who have not been able to benefit from these reforms.There is reported use of torture, restrictions and control of media, forces, disappearances, extensive human rights violations… and so much more. I’m afraid you have forgotten those who suffer, and those who suffer. Violence is used as a form of keeping power. The national court of Spain made a decision and indicted the PRG for genocide in Tibet. China is a beautiful country with a rich culture, and Tibet is part of that culture. You speak of poverty and development, and yet you forget human rights. I find it strange, though I don’t judge you. I just want you to know that it is more than just political, and I think that because the Chinese government has a similar view as you of the situation they do not wish to talk to the Dalai Lama, for example. I think that hinders any chance of peace or of unity and, to be frank, it isn’t only about the country but about the people. Even if you are suspicious, and even if you doubt their reasons, you should give someone the chance of expressing themselves and allow the chance of finding some sort of solution that does not involve the genocide of innocent people. You and I are very fortunate to live in the countries we do, and where we are coverage of these issues are not always neutral or received. Neither of us lives there, so it’s hard for us to know or even begin to understand the situation. Just be careful when you speak of the Ukraine and of Tibet, please. Your comment reveals true Communist intention, brainwashing its own citizens and intimidating foreign aids ( for Tibetans), US might not be genuinely interested in helping Tibetans however Tibetans themselves have found resonance among international communities. The whole concept underlying Tibet crisis began when Communist China illegally sent PLA troops to occupy the region in the name of liberation, China still vindicates its occupation saying Tibetan society was backward and needed to be uplifted, well in international law invading or forcefully occupying other territories in the name of social and economic ( or political) progress is illegal, that was Tibet’s internal matter and it should have been left for Tibetans to solve it.in these 60 years Tibetans in all three historical regions of Tibet have continuously rejected Chinese rule, thousands died, many more locked up in jails, in Panchan Lama’s speech during provincial congregation slammed Communist China of destroying Tibetan culture and political freedom, he further quoted ” Chinese rule has brought more suffering in Tibet ”, few days later he died due to massive heart attack ( it is believed the then party boss of TAR conspired against him)…. monks are forced to denounce the Dalai lama, they are routinely taught communist history which asked them to accept Tibet being a part of China since ancient time, at least 120 people self immolated in protest against Chinese policies, and it still continues. 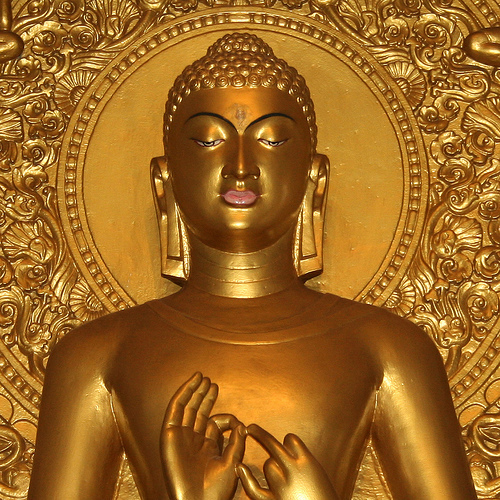 Tibet Awareness – Bodhisattva Avalokitesvara. NOW THERE IS NO “MIDDLE WAY” FOR TIBET. THERE IS ONE AND ONLY ONE CORRECT WAY FOR TIBET. TIBET AWARENESS – THE CORRECT WAY TO FREEDOM. Potala Palace built by the 5th Great Dalai Lama. TIBET AWARENESS – THE CORRECT WAY TO FREEDOM. Red China – Subjugator – Occupation of Tibet.